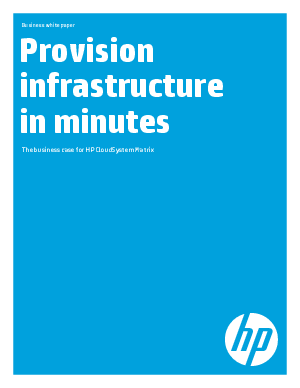 This paper is designed to help you understand the business case for HP CloudSystem Matrix, an Infrastructure-as-a-Service (IaaS) for private and hybrid cloud environments, allowing users to provision infrastructure in minutes for physical and virtual environments. CloudSystem Matrix delivers one virtualized pool of network, storage, and computing resources that can be continuously optimized and instantly adjusted to meet dynamic business demands. It unites the tools, processes, and architecture of your physical and virtual worlds to help you cut costs, and speed up service delivery time. This paper outlines potential savings on capital and operational expenditures, stemming from various product characteristics. Specific savings examples are provided that outline hypothetical moves from rack servers to an HP CloudSystem Matrix configuration; a basic HP BladeSystem configuration to an HP CloudSystem Matrix; and a HP BladeSystem with Virtual Connect FlexFabric to a HP CloudSystem Matrix.